Your first boston is always going to be your favorite and have a special place in your heart. Lady was our first boston that we acquired in 1990. 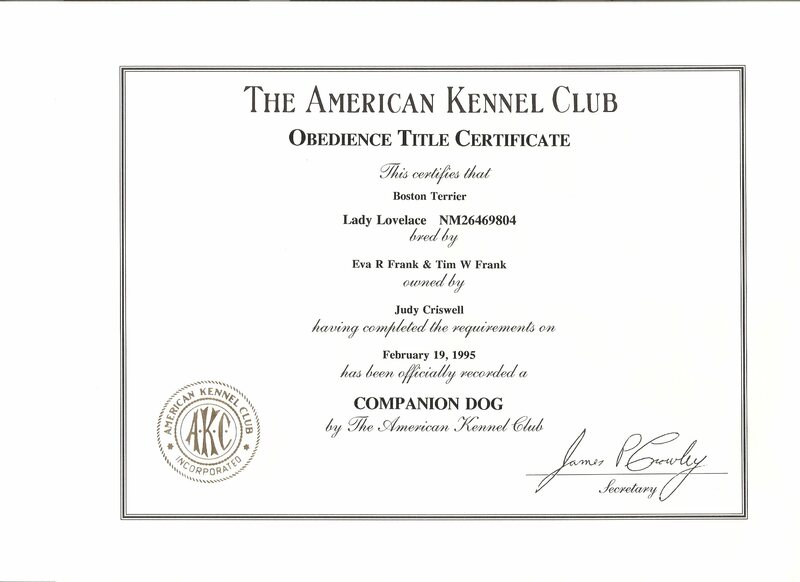 Lady is our first CDX boston in a long line of Juwell's obedience trained bostons. Our daughter, Shannon, enjoyed exhibiting Lady in the Jr. Showmanship ring. They worked well together and made a very good looking team. In this picture Shannon had earned a First place in her class. 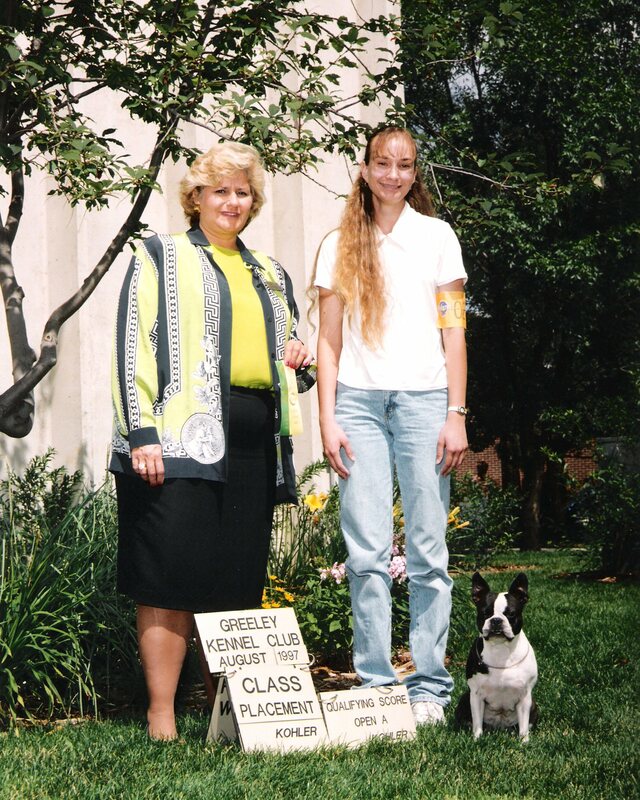 Shannon and I enjoyed doing obedience together. 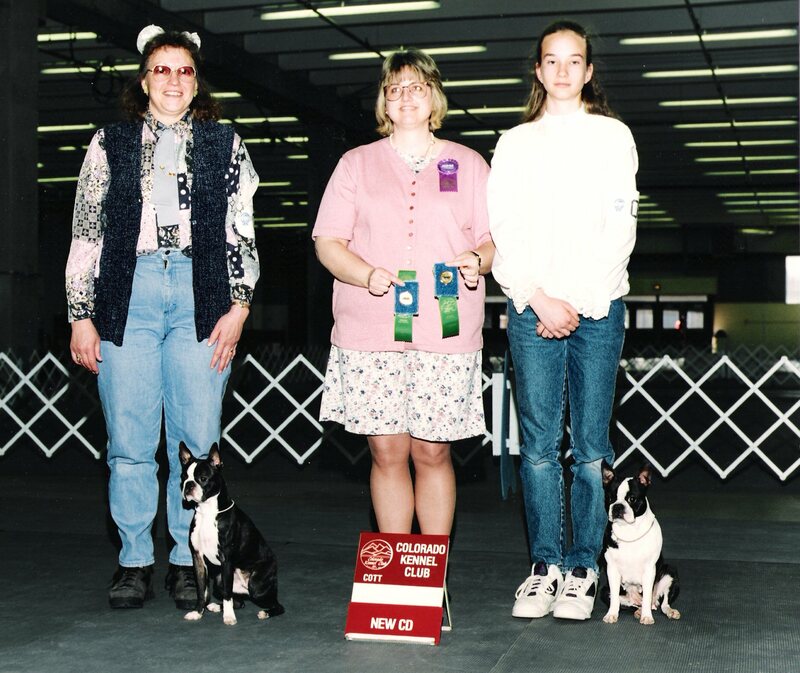 In this picture, Lady and Shannon earned a CD obedience title in the Novice obedience ring on February 19, 1995. 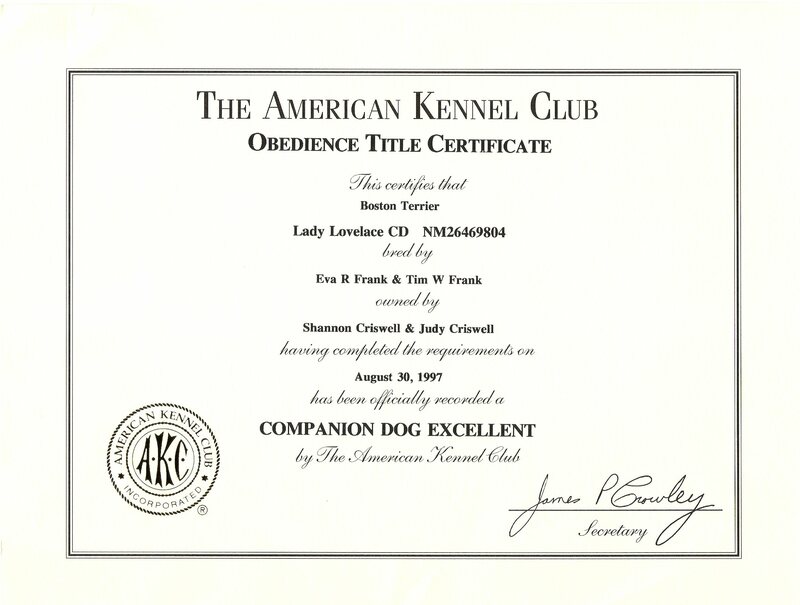 At the same show, Scarlett and I earned a CD obedience title also. Scarlett is a daughter of Lady's. 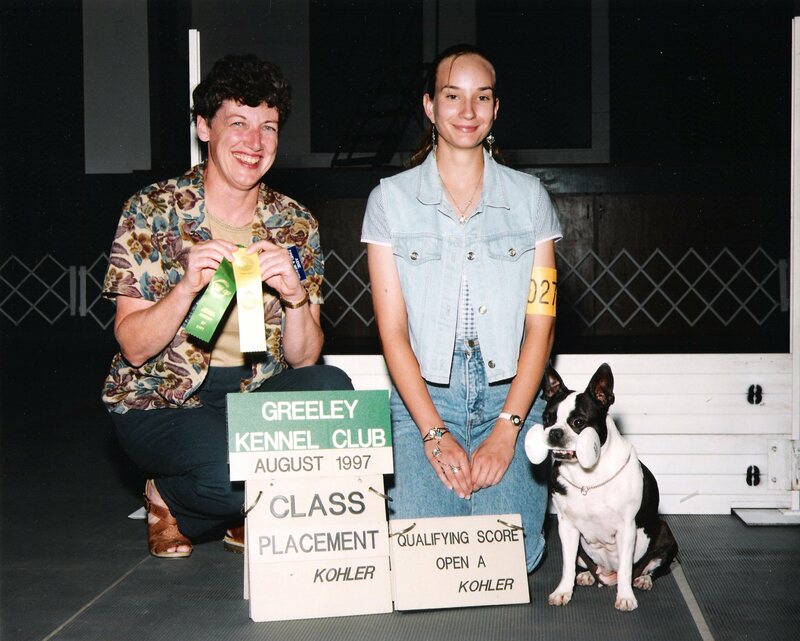 Lady and Shannon placing 3rd in the Open obedience ring with a score of 186 1/2 on August 16, 1997. This earned Lady her 1st leg toward her CDX obedience title. 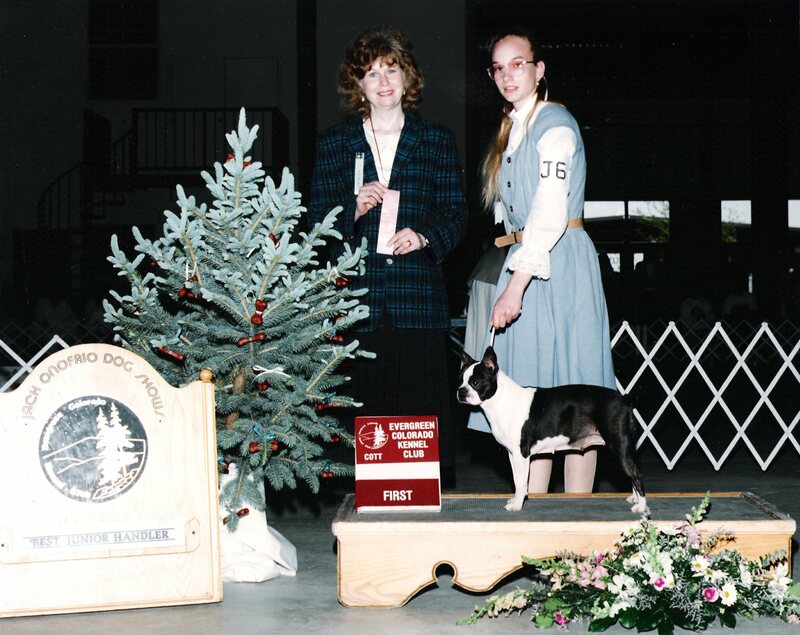 Lady and Shannon earning a 2nd leg in the Open obedience ring and placing 3rd with a score of 190 on August 17, 1997. 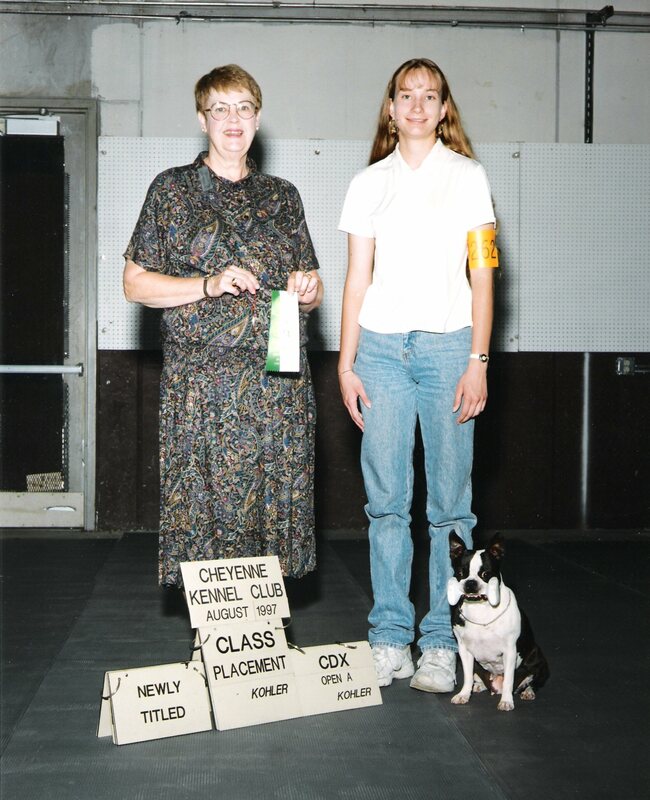 Lady and Shannon earning a 3rd leg in the Open obedience ring and placing 4th with a score of 188 on August 30, 1997 to earn Lady's CDX Obedience Title. Lady didn't have the most impressive pedigree, and never earned a Ch., but you couldn't have asked for a much sweeter, well mannered, smart, and willing to please dog. Lady free whelped 4 litters, and is the mother of my first Home Bred champion,Annabelle. Click on picture for Lady's pedigree. We have lost both our Daughter, Shannon, and our boston, Lady. They will NEVER be forgotten.